Olympus launches the latest model to join its E-series range of DSLRs. Some Olympus users might have been expecting the E-520 to incorporate a tilt-and-twist LCD screen and perhaps an updated autofocus system to replace the three-point design on the E-510. Sadly neither of these made it through to the final design, which may disappoint some people who were hoping that the E-520 would havebeen a bargain-priced consumer version of the E-3. However, there's really no need to be disappointed. The twisty screen may not be there, but there are some interesting developments. First off, the sensor in the E-520 is a similar type to the professional chip used in the E-3. It boasts a greater dynamic range than the E-510 and that's something we can confirm. Many of our test shots showed how the E-520 can really hang onto those highlights while still bringing out plenty of shadow detail. A-300 series, so there's still a bit of a lag. However, it's an improvement on the old mirror-flapping faff that most Live View systems employ and that face detection feature really does work. So, the E-520 has an upgraded focus mechanism and a better sensor, albeit with the same number of megapixels. It's not a lot to write home about so surely there must be something else? Well, if you dig a bit deeper there are a few more tweaks but this is essentially a minor face lift, designed to keep the E-series ticking over in an ever-more competitive market. There have been one or two cosmetic changes, including some smart black buttons and a much-improved mode dial and thumbwheel. Earlier models in the series had rather tacky-looking grey buttons and chunky Lego-style dials that cheapened the look of what was a very capable camera. Olympus has fixed this and the E-520 looks every bit as smart as the old OM series of SLRs that partly inspired the current Olympus digital line-up. All Olympus DSLRs use the Four-Thirds image-sensor format. This is less rectangular than the APS-C sensor that most other manufacturers use and it's also smaller. On the one hand, a smaller sensor can mean a smaller camera and a smaller lens design. On the other hand, it also means there's an increase in the pixel density and that can translate into higher ISO noise levels. And, true enough, if you pixel peep long and hard at the images from a Four-Thirds sensor you may notice slightly higher noise levels, but the E-520 does a really good job of keeping them under control. When you print out the image you realise that extra noise doesn't add up to much. 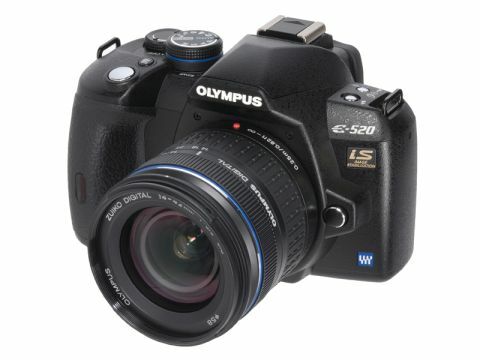 The glorious Olympus colours and superb kit lens make this a compelling option for a first DSLR. The general build quality of the E-520 is superb. The plastic body is beautifully constructed and all the switchgear is top rate. The camera fits snugly in the hand and the ridged grip to the front lends a reassuring solidity to the package. At the rear there's a 2.7-inch HyperCrystal II LCD screen. With 230,000 dots, it's not an ultra-high-resolution screen, but it's more than ample for reviewing shots and the quick zooming review feature using the thumbwheel control is much easier than some long-winded alternatives. On the top of the camera is the newly redesigned mode dial and thumbwheel with their smart black knurled finish. There are 32 scene modes selectable via the dial and the on-screen menu. There are the usual P, A, S, M settings, which should bring comfort for those stepping up from a compact camera. As briefly touched on, face detection and image stabilisation are included. The image stabilisation is built into the CCD of the E-520 along with the highly effective Supersonic Wave Filter for shaking off any dust particles from the image sensor. The Olympus dust system is probably the best on the market at the moment and is a big factor in keeping many people loyal to Olympus. Live View is currently all the rage and the E-520 doesn't disappoint. Pressing a button flips up the mirror and puts the camera in Live View mode. At this point, the camera measures the focus distance using a Contrast Detection mode reading directly from the camera's image sensor. It's an 11-point system and improves on the E-510's mechanism but, as we said, it's still unable to compete with Sony's A-300 in this respect. However, the field of view in Live View is 100% and colour is accurate, which is more than can be said of Sony's clever system. As well as these goodies, the E-520 now includes a wireless flash capability, providing you have one of the new FL36R or FL50R external flash units. They're not cheap to buy but the system works well and opens up new creative opportunities. Another innovation borrowed from the E-3 is Shadow Adjustment Technology. The E-520's TruePicIII image processor can pull out more detail from shadow areas without blowing highlights; this is similar to Nikon's D-Lighting and Sony's D-Range Optimiser technology. You can set it to work on JPEG images or invoke it later on RAW files using the optional Olympus Studio software. And that's about all in the way of new features that the Olympus E-520 has to offer. Now, since the E-510 was a well received model and has barely been on the shelves for a year, the E-520 brings some welcome extra features although it could disappoint those who were looking for a little bit more. It's probably not going to attract a rush of existing E-510 owners into an upgrade, but the wealth of functions on offer and the great image quality and keen pricing will surely attract plenty of first-time buyers looking for a bigger bang for their buck.